It’s hot outside and although I cook for a living, this is a season when I want to spend as little time over a hot stove as possible. That’s why I’ve been turning to dishes like this Tomato Avocado Chicken or this Sesame Snap Pea Chicken to limit my use of the stove. Carbonara is another quick and satisfying meal, but a traditional Spaghetti alla Carbonara still requires two pans to make. 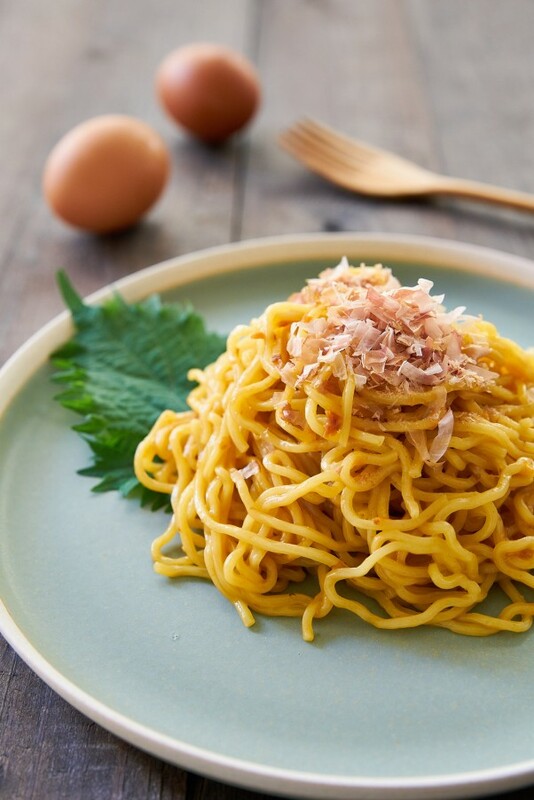 I’ve made a ramen carbonara before using instant noodles, but this time I wanted to see if I could make one from fresh noodles incorporating more Japanese flavors. 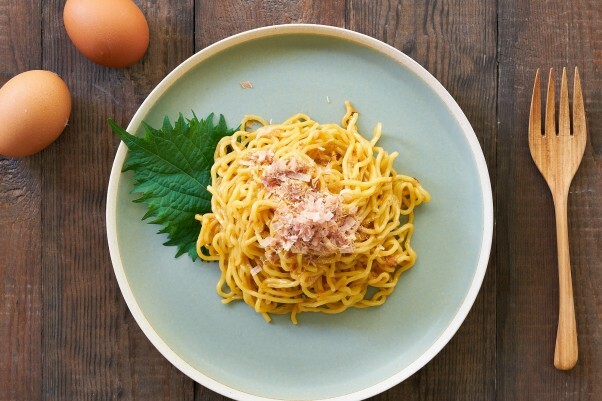 Like a classic carbonara, the sauce is made with egg yolks, but instead of olive oil I used melted butter, which provides a marvelous creamy richness. For the seasonings, instead of guanciale and pecorino romano, I turned to the Japanese pantry and used a combination of Katsuobushi and soy sauce. Katsuobushi is Skipjack Tuna (often mislabelled bonito), which has been steamed, dried, smoked and then aged like cheese with a type of mold. It’s flavor is more meaty than fishy and it’s packed with an insane amount of natural umami producing compounds like inosine monophosphate. I think the simplest way to describe it, is that it tastes like a good dry-cured smoked ham like Speck, minus the salt. 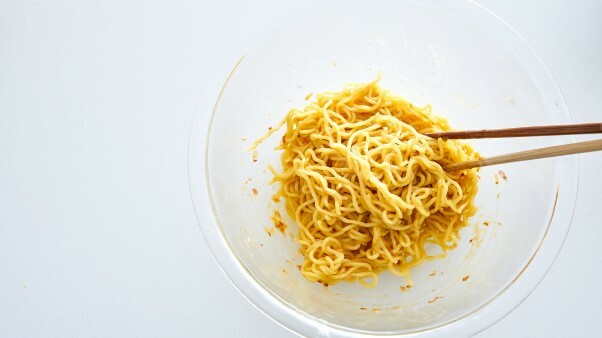 Depending on how long your ramen takes to boil this comes together in around 5 minutes, for which you’ll be rewarded with a luscious pasta with a depth of flavor that will have you smacking your lips in delight. Because the egg yolks are used raw, be sure to use pasteurized eggs. Bring a large pot of water to a boil. You can add the butter to a bowl and set it over your pan briefly to melt the butter. 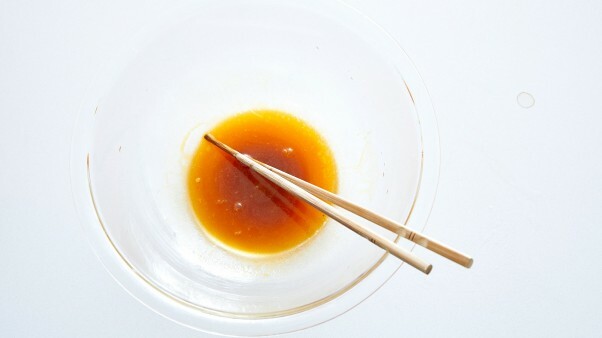 Whisk the melted butter together with the egg yolk and soy sauce until the mixture is emulsified. Boil the ramen according to the package directions (mine took 2 minutes to boil). 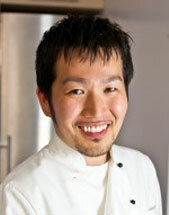 When it's cooked, drain the ramen and toss it with the egg sauce and katsuobushi. Add black pepper to taste and serve immediately.